Marchesa the Black rose with infect theme. 1) The main theme I wanted was infect opponents without having to attack with the creatures. Using Warstorm surge and/or stalking vengance and/or flayer of the hatebound. Warstorm surge will allow you to infect opponents when you play a infect creature and stalking vengeance will infect them when the creature dies. So the ideal play is to set up warstorm surge and stalking vengeance play a creature then sack it to phyrexian tower/alter to give you mana to play the next creature. Sneak attack will allow you to do this for even less mana and you wont need the sack outlet. If this isnt enough to kill them proliferating the counters will. Marchesa is infinitely useful for this deck you can swing out with creatures gaining(hopefully) the dethrone trigger from Marchesa increasing the amount of infect thats going to be dealt to the enemy. This is the main combo the deck is built around there are other support cards in the deck to make this easier/more potent. 2) Unfortunately Infect isn't always the best theme to rely on so kiki jiki and Mikaeus are two easy combos to put in as a plan B that fit well with the deck. Kiki jiki can be used to copy some of the infect creatures to give infect with the first combo. Mikaeus is a combo king, with marchesa you will never lose a creature to the graveyard. 3) When all else fails just hit em. 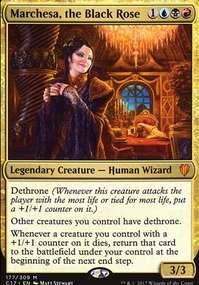 Marchesa dethrone works well with infect creatures because you are not lowering opponents total health just adding counters so you will be able to keep getting that dethrone trigger every combat.